The primary responsibility for enforcing fish and wildlife-related statutes and regulations in Alaska lies with the Alaska Department of Public Safety, through its Division of Alaska Wildlife Troopers. Biologists and other staff of the Alaska Department of Fish and Game (ADF&G) sometimes participate in enforcement activities and assist the Wildlife Troopers as needed; however, law enforcement is not a primary function of ADF&G. Monitoring commercial big game services (pilots, transporters, etc. 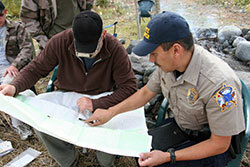 ), and identifying illegal guiding and transporter activities. Preventing unlawful and illegal fisheries harvests, and sales of sport fish and commercial wild stocks. Preventing waste and illegal harvest of hunted or trapped species. Protecting watersheds and other important habitat areas, including by reducing non-compliance with environmental permits. The division also enforces other types of regulations passed by the Board of Game and the Board of Fisheries. This includes those designed to protect Alaska’s native species from harmful invasive species, prevent importation of exotic pets , and prevent illegal export of animal parts from Alaska. Usually, the most direct way to reach an officer and report a violation is to contact the nearest Alaska Wildlife Trooper office. You may also report violations through the Alaska Fish and Wildlife Safeguard program.